Chrichton's World: Review Best of the Best (1989): The best indeed, a feel good sports movie on par with Rocky. Yes I said it. Deal with it! 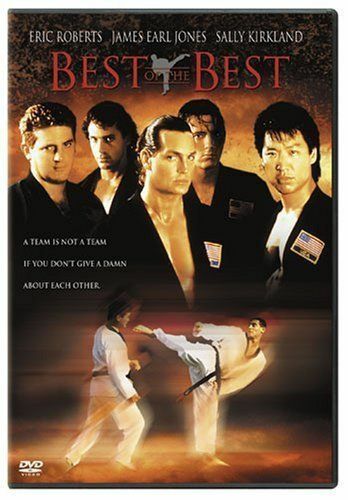 Review Best of the Best (1989): The best indeed, a feel good sports movie on par with Rocky. Yes I said it. Deal with it! The first in the series and one that stands out from the rest because it is less a martial arts movie but more a feel good sports movie where martial arts is featured. But make no mistake the martial arts in this film is among the best ever put on screen. Obviously Best of the Best is a low production B film that at first glance might not look like much. But if you are willing to give it a chance you will see there is more to it than you expect. While the martial arts plays an important role it's more the mentality and philosophy behind it that makes this one appealing. Of course this film can't escape the stereotypes and clichés . But even then you can see that the people behind this film are respectful towards Taekwondo and martial arts in general. (Although it is a little confusing that USA referred to themselves a National Karate team instead of a Taekwondo one. But I am sure you can blame some ignorant stage builders for that oversight.) They tried to give a positive spin instead of only focusing on winning and competing. Granted not all subjects touched upon come out well. Sometimes it might be a tad too melodramatic especially at the end. Although at the time it was not something I saw coming and even now many years after it gets to me. The positive message does seem to be sincere and genuine and I can only applaud such a thing. With a good cast like James Earl Jones, Eric Roberts, Christopher Penn and Sally Kirkland Best of the Best certainly has an edge over similar B sports movies. Last but not least we get to see the Rhee brothers do their thing. And it's magnificent. Both Philip and Simon shine an easily steal the show with their fight choreography. Best of the Best still stands up today. In fact you can call it a classic. One you can watch over and over again and never get tired of it. Mostly because it does more right than it does bad. It is therefore quite puzzling why the sequels to this good film have strayed away from the formula so much. Any way if you have not seen this film yet and you are a fan of feel good films and martial arts you owe it to yourself to watch this one. One I can wholeheartedly recommend!